Pattern blocks have been a favorite in our house long before I began homeschooling my daughter. They provide endless hours of fun and are deceptively educational. Each time your student places blocks together, they are developing a sense of shape relationships. Additionally, there are numerous opportunities that fractions come into play as your students discover facts such as two trapezoids equals the same amount as one hexagon. 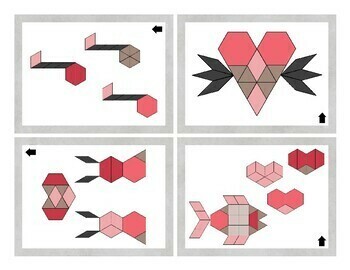 I have included 20 different Valentine themed pattern block task cards. 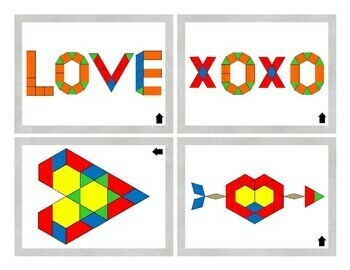 These cards contain designs that are varying degrees of difficulty. Since I included four color options, you can provide this activity to students of different levels in your classroom. The cards containing traditional colors are easier to replicate than the ones that contain an outline or are solid black. I've included three different data sheets. You can use one or all three based on the needs of your students. The second data sheets asks students to graph the number of times they use each block to complete their design. The third data sheet asks students to create two designs, draw them, and answer questions comparing the two designs. In case you do not have a set of pattern blocks in your classroom, I have included printable ones that are scaled to the same size as traditional wooden pattern blocks. 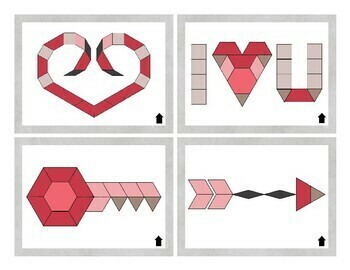 I also like to use these printable blocks to have my daughter create pattern block artwork by gluing the pieces we've printed to construction paper. The Valentine Pattern Blocks activity is great for use in math centers, as a fun task for early finishers and eager learners, or even as an engaging take home activity for students to complete with their parents. It even works well as a small group activity for several students to complete together. 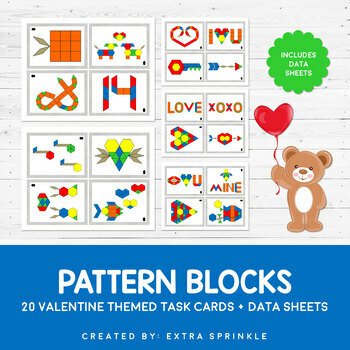 Thank you again for your purchase of the Valentine Pattern Blocks Activity I hope that you love it as much as I do.